Slumdog Millionaire, please collect your Best Picture Oscar. 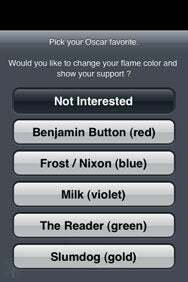 Sonic Lighter users can use the color of their flame on the virtual lighter app to register their choice for Best Picture. Oh, sure, the 81st Annual Academy Awards won’t be handed out until Sunday night. But if the users of the Sonic Lighter app for the iPhone and iPod touch are any indicator, then the makers of rags-to-riches story of a Mumbai teen might as well start memorizing their acceptance speech. Sonic Lighter is a $1 novelty app that turns your iPhone or iPod touch into a mobile lighter. There’s a social network aspect to the app, too, as its developer, Smule, can track wherever someone “ignites” Sonic Lighter anywhere in the world. Here’s how the Best Picture race is shaping up, according to Sonic Lighter. To that end, Smule puts out Sonic Lighter updates that let users weigh in on issues of vital import—in this case the winner of the Best Picture award. As of this writing, Smule’s Sonic Lighter map shows Slumdog Millionaire leading the way with 37 percent of the vote. The lamentable Curious Case of Benjamin Button is in second right now with 27 percent, while Milk is in third with 16 percent. iSlumdog Millionaire : Speaking of Best Picture contenders, this $1 offering from CyberNet Consulting lets you listen to the movie soundtrack and look at production stills of the multiple Oscar nominee. Movie Challenge Oscar Special : Redwind Software produced a $1 Oscar-specific version of its Movie Challenge trivia game. Awards: Oscar Edition : The $1 app from CoreyDale offers Oscar history as well as a way to mark off and share your predictions for this year’s awards.